India suffering again ahead of the World Cup. After a week long break for the Men in Blue to unwind and relax, Indian fans hoped that their champions would bounce back, but in vain, the Indian Team yet seemed to be in a holiday mood and suffered a humiliating loss of 106 runs at the hands of the Australians. On a bright Sunday morning in Adelaide it seemed like the only aim of the Australians was to make their guests suffer even more. David Warner walked out on the field and took the Indian bowlers left and right smashing a century,in the absence of Captain Clarke. Indian pacers were blasted all over the ground with Mohit Sharma (2/62) going back to the pavilion with an economy rate of 10.33 from six overs. Mohammed Shami (3/83) took three wickets but was hammered for 83 off 9.2 overs. Only spinner Ravichandran Ashwin had respectable figures of 6-0-29-0. The Australian innings was dominated by David Warner followed by Glen Maxwell, and these two made sure that their Team would start on a Victory note even in the Warm-Up games by putting up a mammoth total of 370. Australia's David Warner tormented the Indian pacers. The burly left-hander smashed 14 boundaries and two sixes to build his 83-ball knock. Later Maxwell came out to rout the Indian bowlers as it seemed as if his only intention was to make every ball cross the boundary. The explosive right-hander smashed 11 fours and eight sixes to reach his century in a mere 53 deliveries. His last four balls read 4, 6, 6, 6, after which he decided to retire and give the lower-order a chance of having a swing.It was another lacklustre outing by the Indian pacers and India desperately need to revisit their new ball strategy.It also seems that Indian Captain M.S.Dhoni mistook Ian Chappell’s comment that the Indians should open with Stuart Binny. After an embarrassing performance by the Indian bowlers,it was now upon the Indian batsmen to give their fans some reason to smile, but they failed to do so. The openers did a fairly decent job but the middle-order jammed up again leading to a shameful loss of 106 runs less than a week left for their opening world cup match vs arch-rivals Pakistan. Rohit Sharma, Virat Kohli, M.S.Dhoni failed to show their magic, and once again Suresh Raina became an early prey of the Australians. Now being a winless side over more than two months on the same pitches and conditions India certainly need to address their complications before they take on Afghanistan in the 2nd Warm Up Game on Tuesday.10th February 2015. Suresh Raina once again a victim of the Aussie attack. As the countdown begins for the Cricket World Cup 2015, the defending Champions seem to be in a muddle caught with too many issues bothering them immensely. The Indian Fans were expecting their Team to prove themselves after their long rejuvenating week. India once again fell into a pool of troubles with all their departments failing to perform. The pacers were exploited by the Australians and failed to take timely wickets while the only reputed performance was shown by spinner Ravichandran Ashwin. 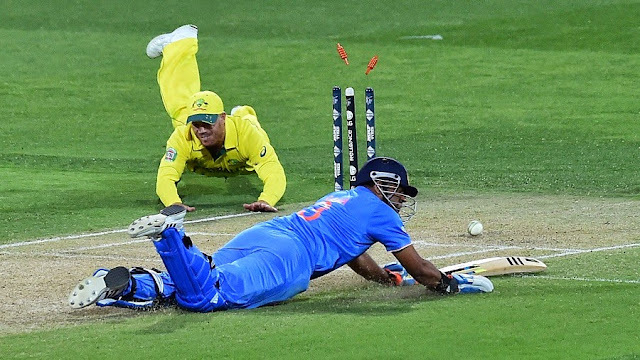 The fielding was not of the required standard, with the fielder of the caliber of Suresh Raina dropping a sitter. They are a quality outfit and I wouldn’t write them off,they have got one of the most successful Captains ever and in the terms of closing off the events.” Captain M.S.Dhoni is known to get miraculous results in the darkest time. which is what we Indians are craving for. India's Men in Blue suffer more woes ahead of the World Cup.